This week’s “how to” article highlights the “Question Status Report,” one of the Questionmark Analytics reports now available in Questionmark OnDemand. Beta – The question is treated in the same way as a normal question. Beta questions can be included in assessments. Who should use it: This report gives testing, assessment, learning and education professionals a quick view of the current status of questions in their item banks. How it looks: This report lists question status possibilities along the left-hand side. Horizontal bars indicate the number of questions with each status. These bars can be color coded by topic as well as question status. The report can be viewed in a web browser or downloaded and distributed as a PDF. The CSV version of this report lists question status in the first column and the number of questions per topic in the remaining columns. 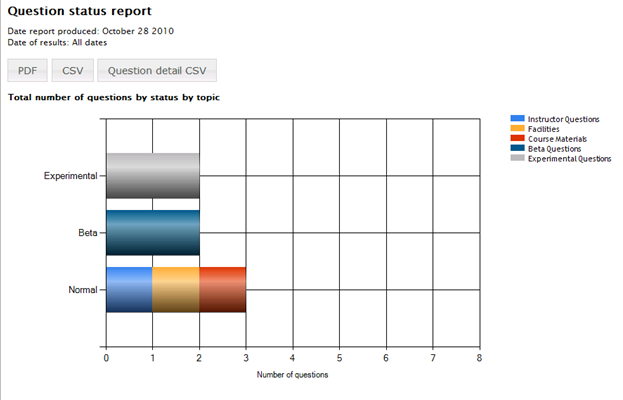 The question detail CSV distribution provides information such as each question’s Perception question ID, wording, description, status, topic and question type. You can see the information for your entire repository or just for specific topics.